"Conception, my boy, fundamental brain work, is what makes all the difference in art"
"Even among the old good painters, their portraits and simpler pictures are almost always their masterpieces for colour and execution; and I fancy if one kept this in view, one might have a better chance of learning to paint at last." "The worst moment for the atheist is when he is really thankful and has nobody to thank." "It is beautiful, the world, and life itself. I am glad to have lived." "A Sonnet is a moment's monument, / Memorial from the Soul's eternity / to one dead deathless hour." "The wombat is a Joy, a Triumph, a Delight, a Madness!" From an early age, Gabriel Charles Dante chose to be addressed by his middle name, Dante, so as to emphasize his affinity with the medieval Italian poet and writer (about whom his father had written extensively). Indeed, Dante had been surrounded by art and literature of medieval Italy, and even as a boy had composed plays and poetry and produced drawings in this vein. Dante was able to develop his precocious talents (for painting and writing) through a combination of home education and schooling at Kings College. He came to love bible passages, Shakespearean tragedies, Edgar Allan Poe and the poetry of Byron. As a teenager he was torn between the ambition to become a poet or a painter and often claimed that his true passion lay with writing and poetry. Rossetti studied at Henry Sass Drawing academy between 1841 and 1845, and then for a further three years at the Antique school of the Royal Academy. 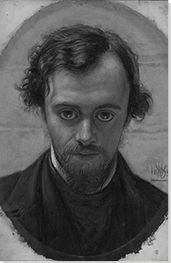 By 1848, still aged just twenty, Rossetti had a wealth of practical training behind him, yet he found himself at odds with the Victorian art establishment. To Rossetti, art of the Academy seemed full of sentimental, fussy and moralistic scenes, and staid, snobbish portraits. Rossetti was refreshed rather by the work of Ford Madox Brown - by his attention to detail, his graphic style, and his daring use of color. This style was far closer to the luminous medieval paintings that Rossetti adored. 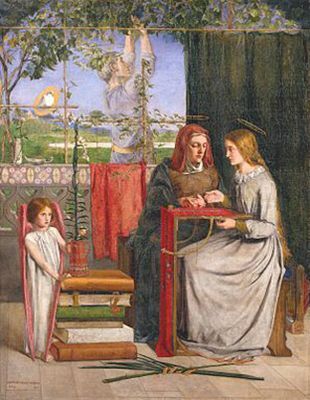 The young Rossetti asked Brown to tutor him, and he maintained a close relationship with the elder painter for the rest of his life. In the mid-1840s, Rossetti attended the exhibition of a painting called The Eve of St Agnes, by a young artist called William Holman Hunt. The painting was an illustration of a little-known Keats poem. 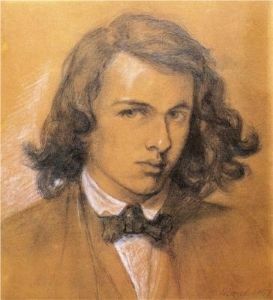 Like Holman Hunt, Rossetti was a lover of Keats, and he saw in Hunt a kindred spirit who may share his artistic ideals and wish to confront the vapid face of the Academy. 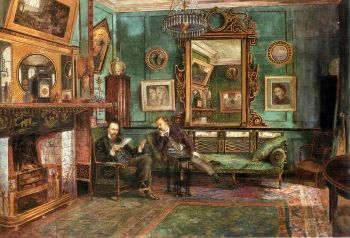 Rossetti and Hunt began to share lodgings in Fitzrovia, and Rossetti became acquainted with a classmate of Holman Hunt's at the Royal Academy of Arts, John Everett Millais. In 1848, the three artists met at Millais parent's house on Gower Street, and formed the first official meeting of the Pre-Raphaelite Brotherhood (PRB). By the autumn, the Brotherhood had recruited four more members: painters James Collinson and Frederic George Stephens, poet and critic William Michael Rossetti (Dante's brother) and sculptor Thomas Woolner. 4.	most indispensable of all, to produce thoroughly good pictures and statues. 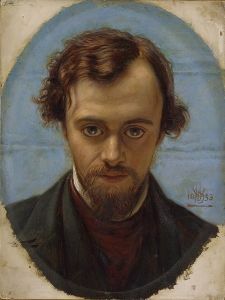 Willian Holman Hunt's portrait of a young Dante Gabriel Rossetti, executed in 1853. The Brotherhood sought to return to a time before the dominance of Raphael and the Mannerist artists who followed him; in other words to emulate the spiritual, mythological and medieval while attending to bold colorization and fine picture detail. Complex and symbolic compositions, jewel bright colours, detailed brushwork and poetic and historical references were all factors shared by the artists. The eminent critic John Ruskin wrote: "Every Pre-Raphaelite landscape background is painted to the last touch, in the open air, from the thing itself. Every Pre-Raphaelite figure, however studied in expression, is a true portrait of some living person". Most of all, the Brotherhood scorned the work of Royal Academy founder Sir Joshua Reynolds, who they collectively despised. The Germ: Thoughts towards Nature in Poetry, Literature, and Art (January 1850). British Library, London. 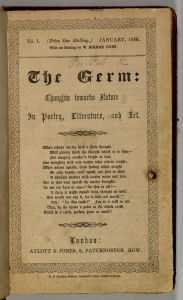 As a way of publishing its writings and poetry, the Brotherhood created its own magazine called The Germ. Not only were the seven members of the brotherhood involved in the publication, but it also became associated with figures such as Christina Rossetti (Dante's sister), Madox Brown, and the critical champion of the movement John Ruskin. The first edition was published in 1850, and the public face of the Pre-Raphaelite Brotherhood was born. It proclaimed; "With a view to obtain the thoughts of Artists, upon Nature as evolved in Art [...] this Periodical has been established. [It] is not open to the conflicting opinions of all who handle the brush and palette, nor is it restricted to actual practitioners; but is intended to enunciate the principles of those who, in the true spirit of Art, enforce a rigid adherence to the simplicity of Nature either in Art or Poetry." 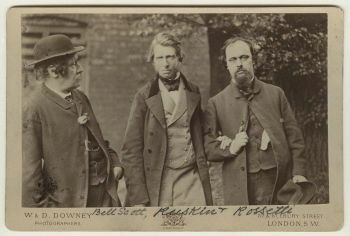 William Bell Scott; John Ruskin; Dante Gabriel Rossetti, by William Downey (1863). Photograph from the National Portrait Gallery, London. Rossetti however courted controversy from the outset. In a series based on the early lives of Christ and the Virgin Mary, for instance, Rossetti used a complex range of biblical symbols and luminous colours to create vivid scenes set in medieval Mediterranean-styled surroundings. Yet, what shocked the viewing public was the way in which the holy figures were depicted as human flesh-and-blood. While the Victorian public may have been willing to accept a stylistic change, they were shocked by the way in which the whole solemn process of painting biblical scenes seemed to have been overturned. 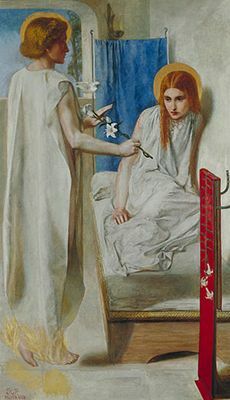 Moreover, Rossetti's scenes had a certain Catholic bent to them which set them apart from Anglican British religious painters. They were richly embellished and focused on the most Catholic of religious figures, the Madonna; they embodied a certain "foreignness," or a European sensuality and old-world mysticism, that set him apart even from Hunt and Millais. By the early 1850s, the original PRB had drifted apart, and Rossetti took his work in a new direction. Rossetti turned away from detailed religious scenes, investing instead in his obsession with female beauty, which he explored chiefly through portraiture. Indeed, mythological portraits became most of his life's work, and the goddesses, tragic heroines and saints Rossetti brought to vivid life were based around a handful of lovers and muses. Rossetti was enthralled most ecstatically with Elizabeth Siddal. In 1850, Dante met Siddal, herself an aspiring artist, when she was just 19 and working as a milliner's assistant. She soon became Rossetti's model, student, lover and muse (she also modelling for other Pre-Raphaelite artists, including famously as John Everett Millais' Ophelia (1851-52)). Some of Rossetti's most adoring sketches and poetry were dedicated to Siddal. And though they married (in 1860), their relationship was tumultuous and not helped by Rossetti's philandering and Siddal's laudanum addiction. In February of 1862, Elizabeth Siddal, heartbroken by another year of Rossetti's affairs, and after suffering her own miscarriage, took an overdose of laudanum and died. Rossetti, overcome by grief and guilt, buried his manuscript of half-finished poetry with his wife, laying it under her hands and surrounded by her swathes of copper colored hair. He then idealised her image as Dante's Beatrice in his painting Beata Beatrix(1864-70). While married to Siddal, Rossetti engaged in sexual relationships with several other prominent models, one of which was Fanny Cornforth. Whereas Siddal tended to model for mythological heroines, Cornforth modelled for Rossetti's more sensuous portraits. Given that Corthworth had worked as a household servant and a prostitute, there was a clear class disparity between the two yet it is known that Rossetti adored Cornforth and the pair remained close until his death. Rossetti had a second important relationship outside of his marriage, with Jane Morris. The wife of his younger contemporary and admirer, William Morris, Jane was unhappy in her marriage, and had known Rossetti, for whom she too had modelled, since the late 1850s. When Rossetti and William Morris went into business together by creating a Furnishing and Decoration business (Morris & Co.) in 1861, the two became even closer. Their affair is believed to have begun certainly by 1865, and increased in intensity after William Morris left the two alone together for a summer to decorate the couple's new house in 1871 (seemingly with some awareness of the pair's clandestine relationship). After Lizzie's death, Rossetti's behaviour became more erratic. He moved into a Tudor House in Cheyne Walk, Chelsea, accompanied by Fanny who resided nearby and who became his "housekeeper." Rossetti surrounded himself with extravagant furniture and exotic pets, including a wombat, cowboy-hat-wearing toucan and a llama! The astonishing house was captured by watercolorist Henry Treffry Dunn, who recalled such details as an "original make-up of Chinese black-lacquered panels bearing designs of birds, animals, flowers and fruit in gold relief." During the 1860s and early 1870s, Rossetti remained prolific in his portraits of beauties. Not only did he continue to paint Fanny and Jane Morris, he also discovered a new model, Alexa Wilding, a dressmaker and actress. He in fact painted more finished works of Wilding in this period than any of his other models. This is due perhaps to the fact that they were not romantically entangled, although the two were close friends. By this late period in his life, Rossetti was desperate to realize his lifelong aspirations as a poet. However, his main body of poetry had been buried with Lizzie Siddall in Highgate Cemetery. In an erratic move, Rossetti exhumed his wife's grave in 1870. He published his first volume of poems in the same year, under the title Poems by D.G Rossetti. However, the work was poorly received and considered overworked and eroticized; an example of "the fleshly school of poetry" as critic Robert Buchanan disparagingly described it. The disappointment of the poor reception of his poems, and a slowing in his painting output, contributed to a mental breakdown in the summer of 1872. Rossetti began to self-medicate with whiskey and chloral hydrate, until he became severely addicted. In 1874, his circumstances declined even further when William Morris cut Rossetti out of their shared decorative arts firm. 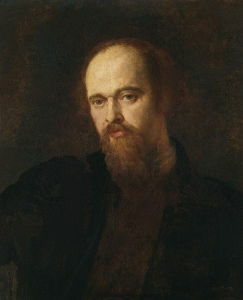 For the remainder of his life, Rossetti became a recluse at Cheyne Walk, housebound due to alcohol psychosis, liver damage, and paralysis of the legs. He died on Easter Sunday of 1882, at the age of 53. Until the very end, Fanny Cornforth had visited and nursed Rossetti (even after she married another man in 1879). His most sensuous and passionate of models and lovers became a lifelong friend and confidante, and went on to pass many of Rossetti's paintings and memorabilia onto future generations. Rossetti was a driving force of the Brotherhood, and artists artists who came to follow him into the second wave of the Brotherhood from the 1850s onwards. 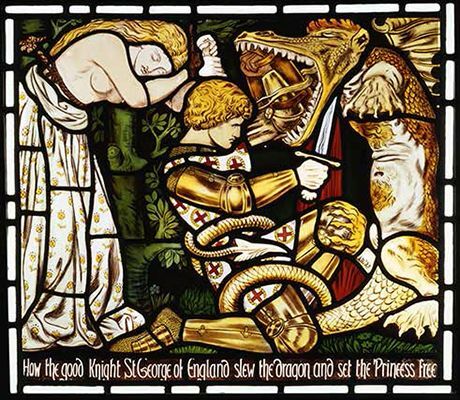 Most significantly, this included William Morris, Edward Burne-Jones and John William Waterhouse. This generation greatly admired Rossetti, particularly his decorative medieval style and Rossetti was a great influence on the Arts and Crafts Movement that Morris went on to form in the 1880s. Following his death, Rossetti was held up as a precursor to Aestheticism and European Symbolism. The cult of beauty and "art for art's sake", alongside a decadent approach to life, were integral to artists and poets such as Aubrey Beardsley and Oscar Wilde. Yet after the turn of the century, Rossetti and the other Pre-Raphaelites fell out of fashion. In the aftermath of the First World War, many modernists associated these artists with a suffocating Victorian culture and/or a kind of decadent blindness to the ills of society and awfulness of the war to come. In the 1940s, Rossetti found the most unlikely of admirers in realist urban painter L.S Lowry. While Lowry painted the grim realities of working life in Manchester, he also was an enthusiastic admirer and collector of Rossetti's work. He even set up the "Rossetti Society" in 1966. He was especially fascinated with Rossetti's visions of female beauty, stating that "I don't like his women at all, but they fascinate me, like a snake." When Lowry died in the 1970s, he left many significant Rossetti paintings to the Salford Museum in Manchester. It is known too that the author J.R.R Tolkien took inspiration from Pre-Raphaelite scenes for his vision of "middle-earth" as imagined in his Lord of the Rings universe. 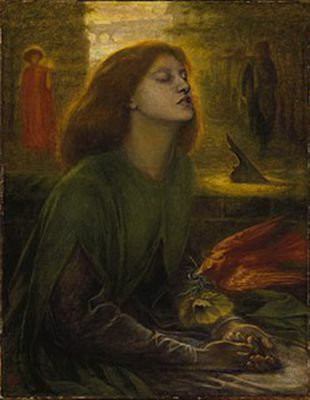 Today, Rossetti's work is reproduced en masse and widely exhibited. 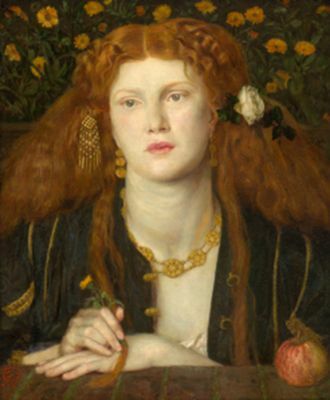 His painting Proserpine sold for over $5 million in 2013, setting a new record for Rossetti's work. Critical perspectives on the Pre-Raphaelite Brotherhood now view the group as the first truly modern British artists; art historian Jason Rosenfeld describes them in fact as the "YBA's of their generation." Rossetti's personal life is also the subject of much retelling and fictionalization, with continued fascination in the women behind the portraits. Contemporary Australian photographer Donna Stevens has recreated Rossetti scenes for the modern age, including her 2015 Love Letters to Rossetti portrait series.